Last week I was remiss in that I forgot to mention Center High School senior Alanna Chacon was named Adams State University Spud Bowl Queen for 2013. Alanna is an outstanding student and leader who qualified for an international science and engineering fair competition last year as a junior, and who has her sights set on gaining entry to the Colorado School of Mines. I believe she is capable of doing anything she puts her mind to, but if that doesn’t work out she’ll certainly have a wonderful education opportunity ahead of her as the Spud Bowl Queen award comes with a full ride scholarship to ASU. I want to thank Center High School principal Kevin Jones and Skoglund Middle School principal Carrie Zimmerman for taking the time to schedule and conduct instructional walks with their teaching staff last week. Taking teachers on these tours of other classrooms allows them to gain in their knowledge of instructional strategies by seeing other staff members using techniques they might not have otherwise considered using, and it also allows us to capitalize on their instructional expertise by offering supportive feedback to those teachers they visited. I would also like to call out Haskin Elementary School first grade teacher Theresa Gallegos, as I caught her using a brain break strategy last week to energize her class while they practiced reciting the alphabet. Research shows that thoughtfully getting kids up and moving throughout the day reinvigorates their mind and allows them to continue attacking learning tasks on a higher level. Thanks Theresa, for applying this strategy and making learning in your class more fun and fruitful for the kids! I would like to offer kudos to CHS-Skoglund teacher Joe Martinez for helping us create an after school fitness club for staff members and students. On a weekly basis the club is guiding cross-fit, cardio, and aerobic exercise activities while also supporting folks with diet, motivation, and body measurement support. It is simply great to see our folks focusing on their own physical wellness by doing these things. 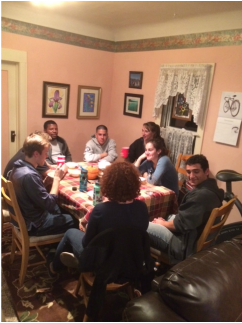 Finally, on Sunday night Becky and I had the pleasure of hosting a dinner for our newest Americorps team, as they arrived in Center late in the day and will be settling in to begin working with our staff members and students beginning on Tuesday November 12th. This crew of 10 members will support our daily and extended day instruction, help put in our offices and library, and conduct community service work around the Center area. We are excited to have them for the next 6 weeks and look forward to the support they offer our educational community. 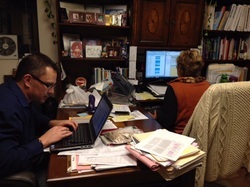 Chris Vance, our Center Virtual Academy director, and Lori Cooper, our director of instruction, have spent the better part of the last month conducting and tying out our annual pupil count process. This was an even more challenging process this year as the Colorado Department of Education is requiring it to be done through its new data-pipeline system. Though there were a lot of bumps along the way we are hopeful that in future years the data-pipeline will make it even easier to complete the process as we move forward. I want to offer a big thanks to Chris and Lori for completing this important task. With the recent election over the Center Schools Board of Education is waiting on the certification of the ballot at each county clerk office before installing its newest board member, Phil Varoz. I believe the board will conduct its regular November meeting as it is currently constituted, and then schedule a special meeting in late November to swear in its new member, reorganize, and to wish outgoing director Margaret Faron well on her future endeavors. Center Schools instructional staff members put in back to back twelve-hour days last week to conduct annual fall parent-teacher conferences. Based on attendance information it looks like many of our elementary teachers were able to meet with all of their parents, and grade 6 through 12 conferences were well attended also. Last Monday I attended a ConnectEd webinar to learn more about how educators all over the state can stay in contact with each other in support of staff development efforts, instruction, and instructional improvement. On Tuesday I attended a Saguache County Commissioners work session to report on and discuss the funding of the Fyock Community Library. On Tuesday we also had the pleasure of taking Dr. Carmen Simone, the new Trinidad State Community College President, on a tour of our schools. While later that afternoon Representative Scott Tipton taught our Center High School American Government students about how a bill becomes a law, and then toured the campus as well. On Wednesday and Thursday we had Parent-Teacher Conferences. I spent the day on Thursday conducting Race to the top of the Valley work in support of curriculum, assessment, and implementation of one to one devices in classrooms. On Monday several superintendents from around the San Luis Valley will be on campus in Center to take part in a walkthrough coaching process. On Tuesday I have my monthly marathon of meetings as I will attend the San Luis Valley Superintendent Advisory Council meeting in the morning, our District Accountability meeting in the early evening, and out regular November board of education meeting at night. On Thursday a good portion of the Center Schools administrative team will be travelling to Ellicott to participate in a district knowledge sharing session. We are excited to see what we can learn from our friends on the eastern plains. On Friday I will be back in Center with my most important task being to interview potential long-term science/math substitutes to cover classes when staff members are out on state, national and international science, technology, and engineering competitions.